microcirculation test Review: Is it Worth It? 1. Fix the screen on the top of the mechanical machines. 2. Plug in the power line and vidao line to the interface of the base. 3. Connect the plug, the plug shows green lights. Press the “Power” button of the screen, wait 3 seconds, the screnn will light. 4. Paint three drops of oil at the position of the intersection of the ring finger nails and skin. Put the oil coated finger in finger hold. 5. Adjuet the coarse hand wheel, when the screen displays images, then adjust fine handwheel. Picture becomes clearer. The bigger one is the coarse adjustable wheel and the small wheel is the fine handwheel. When the machine is about 2-3cm away from the finger, there will be a transparent image on screen. 6. Then, adjuet platform lateral movement handwheel to et a correct position of the first line of the vessel( capillary tube ) and adjuet the fine coarse handwheel to get a clear picture of the vessel. Your fingers will move from left to right on the double loading platform. So try to find the first line of vessels by rotating the platform lateral movement handwheel to change the position of the finger. And finally rotate the fine handwheel ( the position is showed in the structure ) to get a clear picture of the vessels. 7. If there is spot on the screen, rotate the carmera right and left to eliminate it. 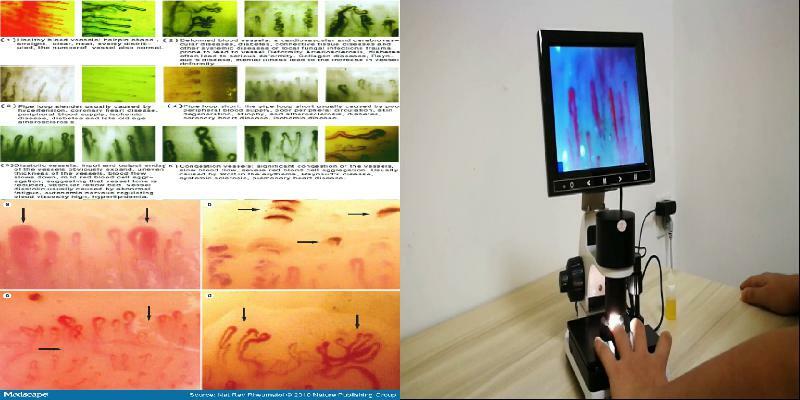 The microcirculation test is a low power microscope designed for the specific purpose of examining the small capillary blood vessels in the nail bed of the finger. This is a relatively new technique designed to study the effectiveness of the peripheral circulation and appears to have applications in chronic inflammatory conditions such as rheumatoid arthritis. Oil such as peanut or microscopy immersion oil is applied to the skin at the base of the nail bed, this makes the peripheral capillaries of the skin visible under direct illumination and the shape and course of the vessels can be studied. The microcirculation test has been developed for this examination, and has a built in analogue CCTV camera to allow direction vision with an analogue monitor or a conventional television. The image can be displayed on PC or laptop with the aide of either an internal PCI card (for PC), or a signal converter such a WinTV (laptop) or Canopus for Apple. The microcirculation test stand has coaxial coarse and fine focus controls and a mechanical stage with coaxial adjustment to allow accurate movement and adjustment. In the centre of the stage is a finger ‘groove’ to hold the finger steady this will rotate through 360° for the optimum position, and the mechanical stage controls allows fine movement to study particular areas. The stage movement range is 25 x 70 mm. The optical specification includes a x4 achromatic objective with a working distance of 37.4mm, which together with the CCTV unit provides an effective x50 overall magnification (without taking into account any amplification produced by the display monitor). The microcirculation test has a rheostat controlled incident light source which is non-infrared and low temperature and therefore ideally suited for the application. The angle of illumination is fully adjustable. An AC/CD 9v 500mA transformer plug is supplied . There is a phono AVI output at the base of the microscope and the appropriate CCTV cable is supplied. Where need the microcirculation test nls device? All these techniques are very diverse and complementary. This makes it possible to combine them together for achieving the best possible results in the work of holistic doctors, as well as alternative practitioners and naturopaths. Where and who need the microcirculation test? Prev: Why that terrible metatron diagnostic machine review is actually a blessing. Next: Why you should get out of your own way and metatron diagnostic machine review already.